'Fire' was written by Bruce Springsteen and was originally intended to be used by Elvis Presley. Robert Gordon ended up being the first artist to record the song in 1978. 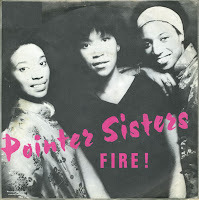 Later that year, the Pointer Sisters recorded their version. It gave them major worldwide success, reaching number 34 in the UK singles chart and number 1 in the Dutch Top 40. Although he performed the song live from his 1978 tour onwards, Springsteen himself did not release his own recording of the song until his 1986 'Live/1975-85' album, which contains his (heavily edited) December 16, 1978 performance.